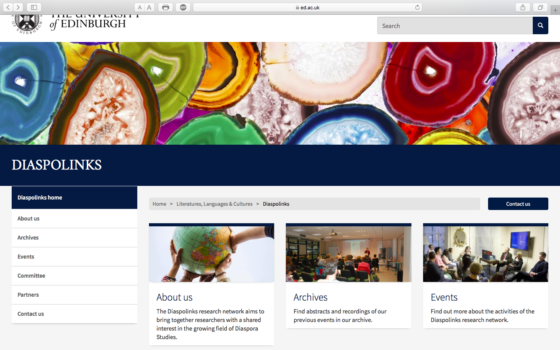 The Diaspolinks research network aims to bring together researchers with a shared interest in the growing field of Diaspora Studies. Diaspolinks is an international Diasporic Studies network which seeks to promote research into migrant communities as well as the cultural productions of writers and artists from such communities. The network brings together specialists in the fields of anglophone and francophone diasporas such as the Caribbean francophone and anglophone diasporas, African diasporas, as well as South Asian diasporas. Its focus is unique in that it compares the various diasporic communities’ response to issues of identity, belonging and relocation in the specific contexts of British/French and Canadian immigration policies. Diaspolinks is interdisciplinary and seeks to associate the methodologies of disciplines such as cultural studies, sociology, literary studies, and visual and performance arts with each other. A specific focus of the network is on how diasporas reshape the outlines of the new international geography and interrogate the notion of citizenship.The Diaspolinks project first started to materialize in October 2013 with a conference on the theme of ‘The Place of Memory in Diasporic Cultures’ at Caen University organized by Françoise Kral in association with Edinburgh University. It soon became apparent that the comparative approach to anglophone and francophone fields of postcolonial studies which had been adopted helped map the specificities of diasporic trajectories but equally the differences underlying conceptions of national identity and identity politics as well as an understanding of citizenship in relation to the nation. This interdisciplinary focus of the first conference morphed into a more systematically comparative approach to postcolonial studies with the ‘Diasporic Trajectories’ seminar series at Edinburgh University’s IASH, organised by Sam Coombes, which started in February 2015. This series has brought together leading specialists from both the francophone and the anglophone spheres, following the inaugural seminar at which Charles Forsdick and Janet Wilson presented papers. The 2015 series spanned topics as varied as the lesser known history and contributions to artistic life of the Asian presence in Britain (Susheila Nasta), the unrecorded narratives of Rwandan genocide stories (Nicki Hitchcott), and the emerging field of transcultural adoption literature (John McLeod). It has also sparked reflexion on Asian diasporas in the Southern hemisphere and in particular the Chinese diaspora in New Zealand (Michelle Keown), or aspects of the Scottish diaspora to Canada through the prism of the work of Alice Munro (Heliane Ventura). The 2016 ‘Diasporic Trajectories’ series is currently underway and similarly showcases a wide variety a topics in the field of Diasporic Studies presented by recognised speakers in the field of postcolonial studies.